Mastering a racing game is a lot easier with your hands on a steering wheel instead of a tiny thumbstick, but after shelling out hundreds of quid on a console and £60 on a game, do you really want to cough up another c-note for a racing wheel? If you’ve got access to a 3D printer, you could make this cheap rack and pinion mechanism instead and add a tiny thumb-steered wheel to your controller. 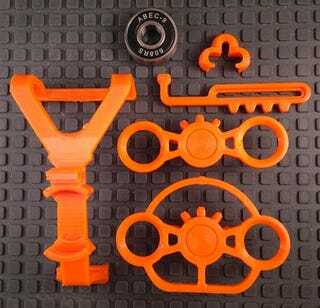 This brilliant, goofy little add-on was created by Thingiverse contributor Pixel2, who shared all the requisite source files as a free download for anyone who wants to print their own.